Following persistant rumours Father Christmas today issued a Press Release confirming that he *will* be delivering presents globally on Christmas Eve. The rumours followed concerns over two key issues: the euro debt crisis and Bribery Act fears. Our favourite banker Alex at Megabank PLC had advised that the annual global give away and delivery of Christmas Presents was not viable in the current economic climate. However, we are pleased to report that today, through an ECB bailout, Father Christmas was able to collateralise mince pies, glasses of milk and whiskey through a complicated forward SWAP arrangement (our banking colleagues advised) and sufficient funding has been received to keep Father Christmas LLC trading through the end of January 2012. 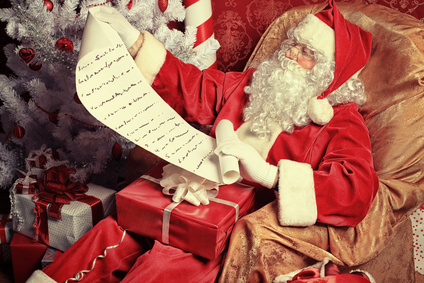 Earlier in the year rumours began circulating that Father Christmas global logistics and freight forwarding operation based in the North Pole may have to close as a result of the entry into force of the Bribery Act. The issue had been put into sharp focus following the recent US DOJ Settlement with Panalpina the Swiss Freight forwarding giant. The CEO of Father Christmas LLC, Mary Christmas, approached us. After discussions with our pro bono committee we were pleased to confirm that we could advise pro bono in view of the charitable nature of the business and overwhelming public interest. While Father Christmas has no physical UK operations and is headquartered at the North Pole (where there is no recorded data of Bribery according to the Transparency International Corruption Perception Index) he delivers globally including to some of the most corrupt jurisdictions on the planet. We concluded that there was a risk that his Christmas eve deliveries to the UK could be interpreted as carrying on a part of his business in the UK under the Bribery Act. The charitable status of Father Christmas LLC did not preclude it from the ambit of the Act. We conducted a detailed ‘Elf Check’ on the global operations with a focus on procurement and delivery operations advising extensively on Facilitation Payment risk and the SFO six steps to compliance. After completion of the ‘Elf Check’ we carried out detailed training for Father Christmas LLC and its various divisions including various visits to the North Pole for face to elf training. For obvious reasons our representation of Father Christmas LLC up to now has had to remain top secret. To maintain secrecy we spoke to our corporate colleagues who came up with the unique codename ‘Operation Elvedon’ – a codename since widely copied by the Metropolitan Police. We advised that the receipt of mince pies and other gifts of nominal value on the night would not constitute a bribe. Above a threshold of £30 there is a tiered approval process. Gifts and presents received above £10,000 are subject to approval of the CEO of Father Christmas LLC, Mary Christmas. We don’t like to blow our own (toy) trumpet. However, in tandem with todays Press Release Father Christmas asked us to reveal that thebriberyact.com and Pinsent Masons LLP have, quite literally, saved Christmas. Merry Christmas, and as you open your presents on Christmas morning…spare a thought for us, without whom it would not have been possible.